Sleaford Town will begin their latest FA Cup adventure full of confidence after securing an impressive away win on Saturday. The club is hoping for plenty of support through the turnstiles this weekend when they host South Normanton Athletic in the extra preliminary round of the world’s most prestigious domestic club competition. Their hopes of a big crowd will not have been harmed by their 3-1 win at Newport Pagnell Town, a team which finished third in the Premier Division in May. “It was a cracking win against a very good side who were title challengers last season and will expect to be right up there again this season,” boss Jamie Shaw told the Standard. “The FA Cup is something that I have really targeted this year as our cup form last season was poor and a good cup run or two can bring so much positivity to the club as a whole. Town made a positive start to their second league match and hit the front after 24 minutes when George Couzens was put clean through by Joe Smith’s precise pass and arrowed a shot across the keeper. The hosts gradually hit their stride and after a spell of pressure levelled nine minutes later thanks to Michael Lyons’ excellent finish from the edge of the box. But Sleaford were not cowed, and before long were back on top and back in front two minutes into first-half stoppage time when Simon Bolland headed in Luke Hollingworth’s fine free-kick. The next goal was crucial and duly went Town’s way eight minutes from time following a good team move involving Couzens, Smith and second-half substitute Liam Harper. A series of intricate passes on the edge of the box finally freed Smith who squared for Harper to tap home the third. Town saw out the rest of the game to chalk up their first win of the new campaign and stir up hope for the cup. They will be desperate to improve their record in the FA Cup, having fallen at the first hurdle in three of the last four seasons and never been beyond the first qualifying round. To do so they will have to beat South Normanton, a side which finished 19th in the Midland Football League Premier last season. 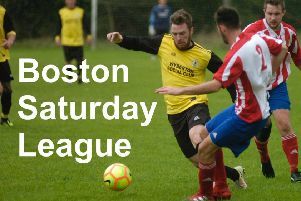 * Kick-off at Eslaforde Park is 3pm on Saturday.